So, my business is finally up and running and I wanna give some bags away. They are so excellent. Really. Truly. What to do? I think a few winners would be good, from around Oz, don't you? Spread the word around about the dudliness of plastic. It's inability to break down in a zillion years. Its lack of sustainability. It's lack of tactility; the feel good factor that we all 'know' but find hard to articulate. Once you use these cotton bags you will fall in love! And realise how many of those 'rip n chuck' plastic fruit and veg bags you used to use or how juggling all those pieces without any bag really was a bit cumbersome. So, rules are. You have to tell me what State of Oz you live in and why you want some bags. Simple really. Oh and tell me what you want. Some of these, or these ?? Or maybe you would like one of these or these? They also make excellent gifts for the person that has everything! So c'mon! Even if you have never visited or commented on 'taurus rising' before, its OK. Gotta be in it to win it.Winners announced Monday. Friend the ethicurean on facebook. Ok, Im going to enter on behalf of my friend Catriona. She teaches a course in sustainable landscapes, grows her own organic food, gets a bi-weekly Hilbarn box, and as a designer, I would imagine that the tactility of the baggies would seriously appeal to her. Cosmic in Tasmania here. Am planning some handmade products for Christmas presents for my friends and daughters. What better way to give them than your lovely bags? Writing from Victoria! 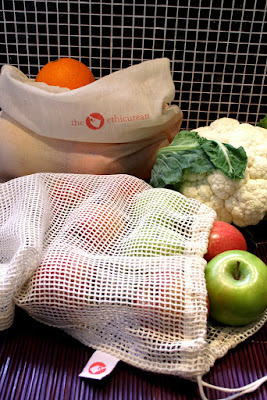 I began to make my own mesh produce bags using a recycled tablecloth, but became unwell so can't handle sewing right now. I'm getting pretty sick of the plastic produce bag accumulation left by my family, so some cotton net bags would be a miracle! Hey there, I am in Brisbane and would love the cotton net bags.They are gorgeous and I am always talking to random shoppers at the fruit shop. Why just yesterday I showed the somewhat reluctant paving man my beautiful wormfarm! So, I would love to show case your fledgling business here in South brisbane. Hi there. I'm writing from Brisbane. I've been admiring your bags from afar. The mesh vegie bags are not too hard to come by now but the cotton netting and plain cotton bulk goods bags don't exist anywhere so good work you! I'd love to try some of the cotton bulk goods bags. Have been thinking about these for Christmas presents too! Congrats on a great store! I'm gonna enter for my adopted Aussie son who is currently in NSW. He's just moved out on his own, and I think it'd be great for him to be able to have some nice bags as he learns to start doing his own shopping. The bags look way fun. I've been thinking about bags like this for a while. Glad to see them! I was sent this link by my good friend Amelia, all the way from Vancouver, Canada. LOVE LOVE LOVE the look of these bags, especially the Fair wage unbleached Cotton Gauze Produce Bags. Every Thursday with my two little sons in tow, we venture down to the local Coffs Harbour Growers markets to buy our weekly fruit & veg. Alas, the bright orange tuelle bags I sewed are falling apart. No strength, no staying power! We SO need some bags like these. I might just have to even get some anyway...! I live in Western Australia, and I'm jumping over from Stand and Deliver. Oh my, I love your bags, I would love to stick my gaudy woolies 'green' bags in the green bag recycle bin and grocery shop in style! They also would be great for storing potatoes and onions. They're just lovely! Hey Kel...am waiting until payday next month to purchase but would love, love, love to win some of your beautiful bags. I'd so love to be able to show them off and spread the word at the F&V market & deli...all the while looking oh-so-very-very-stylish. Am also thinking they would also make a lovely gift for John for our 5th anniversary next week...he is difficult to choose a gift for. Do they come with business cards that I could hand out..?? I just know that at the place where I shop I am going to get questioned, it's that sort of market. Oh yes, I'm in Brisbane and already an Ethicurean friend on FB. Hi. I live in Perth and would love some of the recycled cotton produce bags for my organic bulk nuts and grains. I tried reusing the brown paper bags but they never lasted long. Now I compost them but I would still prefer to have an alternative. I promise to show them off at the organic shops around town if I win!! Oops...forgot to mention last night that I would love the set of gauze bags...!!! Just gave your giveaway a mention on my blog Kel...(for the two or so readers I have left after being absent for ages). Even if I'm not lucky enough to win I'll be around on payday to purchase...they are so pretty. i am in WA and would love the sample set. i have tried other reusable bags but these look funky as well as functional. recycled cotton adds another 'green' step to the design of these bags. Not sure if I'm elegible because I'm in Jackson, Mississippi, USA. But I would love the mesh net bags. And just may order some sets for Christmas gifts now that I've found you thanks to Kerrie! I'm in NSW, and would love to try out the Fair wage unbleached Cotton Gauze Produce Bags. I've been using mesh produce bags for a while now, but these gauze ones look like they'd be great for buying beans etc from the bulk bins at the food cooperative. Hi, I'm in Victoria, and I'd LOVE a set of the recycled organic cotton bags, because we've basically got rid of all other plastic bag use in our house, but we're still getting an occasional plastic bag when we buy beans, or peas, or other teeny tiny things that I can't just dump in a big bag!